What are my methods of Payment? How do I deposit using my credit card? How do I make an ACH (bank transfer) deposit? Why hasn’t my deposit been credited? How can I play on your site? How do I start playing Casino games? How can I add www.delawarepark.com/igaming to my list of trusted sites? I forgot my Username/Password. How do I retrieve these details? Why can't I verify my location and play with real money? If geo-location issues arise, how can I resolve them? How will you verify that I am in the state of Delaware? Can my location be verified if my cell phone is roaming? I live near the Delaware border. Will I have trouble with the verification process? How do I upload documents in the Cashier? My address is too long to fit in the address field. How can I enter it? Can I sign up for an account if I live outside of the state of Delaware? How can I cool off or self-exclude from Delaware Park Online? What Promotions do you have on offer? You can make payments using Visa and MasterCard credit/debit cards, ACH (Automated Clearing House), or NETELLER. ACH is a method of transferring funds to and from your bank account into your "Delaware Park Poker " account. We accept Visa and MasterCard Credit/Debit cards. 1. Visit the 'Cashier' and click 'Deposit'. 2. Select 'Credit/Debit Card' from the list of deposit methods. 3. Enter the amount you wish to deposit and fill in the required details. 5. Upon approval of the deposit you will receive a confirmation email, along with your Reference Number - please keep these details for future reference. Gift cards with the Visa and MasterCard logo will not be accepted. A: The Security Code is the last 3 digits printed on the back signature panel of a Credit/Debit Card. Bank transfer, also known as ACH, is a secure, convenient online transfer method for depositing at "Delaware Park Poker ". 1. Log in to your software with your username and password. 4. Select Bank Transfer from the list of deposit methods. 5. Fill out the necessary information and click ‘Submit’. NETELLER allows the instant transfer of funds to your Delaware Park Poker Account. If you already have a NETELLER account, please skip the 5th step listed below. 2. Click on the ‘Cashier’ button. 3. In the Cashier, click ‘Deposit’. 4. Select ‘NETELLER’ from the list of deposit methods. - Fill out the necessary information and click ‘Continue’. - Your unique ‘Account ID’ and ‘Secure ID’ will be displayed on the screen and sent to you via email. Please keep this information safe. - Click ‘Continue’ to see the funding options available for your NETELLER account. 6. Enter the amount you want to deposit, your ‘NETELLER Secure ID’ and ‘NETELLER’ Account ID’. 7. Fill out the necessary information and click ‘Submit’. 8. Once the deposit’s approved, you’ll receive a confirmation email, together with your Reference Number – please keep this safe. Note: You must have a US registered NETELLER account to deposit at Delaware Park Poker.. You can only register for a US NETELLER account if you reside in the US. The minimum deposit is $10. Maximum deposits vary depending on your payment method. Please see the cashier for details. Once a deposit is approved, the money should be credited to your bankroll within the timeframe specified below. - A screenshot of the Online Banking Transfer approved deposit confirmation screen. 3. Enter the amount you wish to withdraw. 1. Log in to your NETELLER account where you will see your Account Summary page. 2. Click on ‘Generate Document’ to download a .pdf document to your computer. 3. Save this document to your computer. 4. Upload the document through the Cashier. Please be advised that upon first withdrawal, you will be required to submit documentation verifying your payment details. Required information will be listed in the Cashier during your withdrawal request. Click 'Request Withdrawal ' to complete the transaction. Note – Once you request a withdrawal, you can use the token number that will be sent to your email address for any withdrawals requests you perform within the next 180 minutes. There are several ways to play on www.delawarepark.com. 1. Download the poker software. 2. Play at the no download casino. 3. Download the mobile casino app from the App Store. 3. Log in and select either 'Real Money' or 'Play Money'. 4. Select the poker game/tournament you wish to participate in and click 'Play'. Additional Info: To find out how you can fund your poker account, please see our FAQ: Payment Options. 1. Launch the no download casino. 2. Log in and select either 'Real Money' or 'Play Money'. 1. 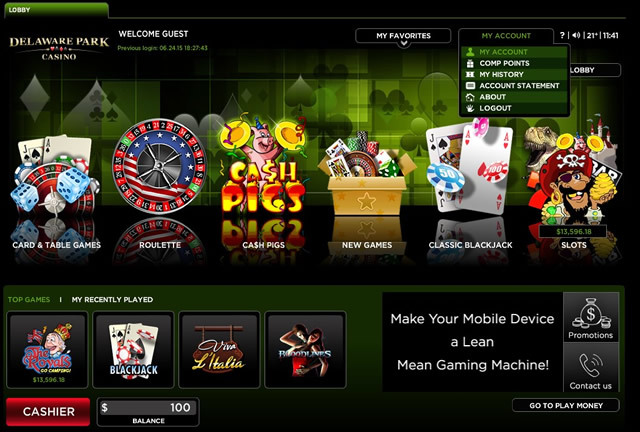 Click on the ‘Enjoy Casino Games’ button in the bottom right-hand corner of the screen. 2. The Casino Games software will appear in a new window. 1. To get to the Main Menu, click on the wrench icon on the right-hand side of the browser. 3. Click on 'Under the Hood' located in the left-hand menu. 4. Scroll down to 'Network' and click on 'Change Proxy Settings'. 5. In the menu that appears, click on the 'Security' tab. 6. Click on 'Trusted Sites', identified by the green checkmark. Then, click on the 'Sites’ button that appears. 8. Click on the 'Add' button. 10. Click on the 'Add' button. 11. Click on the 'Close' button. 12. Click on the 'OK' button. 4. Click on the 'Allow' button. 6. Click on the 'Allow' button. 1. Access the 'Control Panel' in your 'Start' menu. 2. Double click the 'Firewall' or 'Security Settings' icon. 3. At the bottom, you should see 'Internet Options'. If you do not have 'Firewall' or 'Security Settings', double click the 'Internet Options' icon. 4. A new window will appear. Click on the 'Security' tab once. 5. At the top, you should see the 'Trusted Sites' icon. Click on it once, and then click on ‘Sites’. 6. Another box will appear. On the left, you should be able to add sites. 7. Please deselect the ‘Require server verification (http:) for all sites in this zone’ option. 8. Another box will appear. On the left, you should be able to add sites. 9. Please type the following: http://www.delawarepark.com/igaming/ and select 'Add' or 'Save' (according to your computer's interface). Please also add: https://www.secured-cashier.com/login.aspx to the list. 1 . Open Safari if it is not already open. 3. Open 'https://www.secured-cashier.com/login.aspx' in a second Safari window, highlight the page's address in the address and search field, and drag the address to the Top Sites page. 4. Type 'https://www.secured-cashier.com/login.aspx' in a document, highlight it and drag it to the Top Sites page. Can I play from my smartphone or tablet? Our mobile casino app is compatible with iPhone and iPad. You can download it directly from the App Store and play casino games on the go for real money. Due to regulations, Remote control Software cannot be running on your machine at the same time as our application. Please find information on how to close the remote control Software here. If you are still unable to login, please contact us. You are running prohibited program(s) on your device, which need to be disabled. Ensure that you have disabled the specified programs, which may require action beyond closing the program window. For PC, press Ctrl + Alt + Delete to access the Task Manager. From the Task Manager you can force individual programs to quit. For Mac, open the Activity Monitor in the ‘Utilities’ folder of your Applications. From the Activity Monitor you can force individual programs to quit. On a PC, open Control Panel > Programs > Uninstall > and select/remove the program from the list. On a Mac, locate the program in the ‘Applications’ folder and drag it to the trash. Either the username or the password being used is incorrect. For instructions on how to retrieve these details or change/reset your password, please see the following FAQ. 5. "You are already logged in"
You are already connected to our server. This can occur if the software was previously exited incorrectly, i.e. your computer shut down while you were logged into www.delawarepark.com. . For assistance, please contact us. 6. "Establishing Connection to the Server"
Connection may be temporarily unavailable. Please try again in a few minutes. 7. "Your Account has been Temporarily Disabled"
You may have requested to close this account in the past. To resolve this issue, please call our support representatives. Your account is currently disabled. Please check your emails to see if you have been contacted by our Operations Department recently. You may have requested a self-exclusion period which has yet to expire. Alternatively, contact our Member Support Department via the ‘Contact Us’ form. Should none of the above apply, please contact our Member Support Team and describe the exact error message you have received. 1. Click 'Forgot/Change Password' from the login page and submit the required details, as registered with www.delawarepark.com. 2. Please note that your username cannot be changed. 3. If after resetting your password and receiving a username reminder, you continue to experience login issues, please contact us. Why can’t I verify my location and play for real money? As per Delaware regulations, it is mandatory that we validate the individual location within the state of Delaware prior to permitting him/her to make a real money games. In order to determine your location, we will use your IP address and WiFi signal. If we are unable to verify your location by these means, we will try to determine your location via cell phone carrier. To enjoy real money play, you must have a Delaware IP address and your computer must be proxy/VPN free. To verify that your location is indeed recognized as a Delaware IP address, simply Google “Where is my IP address?” and check the results. If, for example, you are in Delaware but very close to Maryland, you might be recognized as having a Maryland IP address. In such cases, please be sure to contact us and we’ll be more than happy to assist you. First, make sure that your WiFi is turned on. Ensuring other surrounding WiFi networks are within range will increase your ability to be located. If no WiFi networks are available, the WiFi adapter may be disabled on the device. This must be enabled in order to resolve the WiFi issue. Mac: Our systems will automatically turn on your WiFi, so there is no need for this to be done manually. PC: This process may vary depending on the version of Windows you are using. Turn off airplane mode by going to Settings > Airplane Mode. Reset all your network settings, including VPN, APN settings, WiFi passwords, and Bluetooth pairing records by going to Settings > General > Reset > Reset Network Settings. Check that you have the latest software running on your device by connecting it to a computer and checking for updates in iTunes. For Windows 7 or Vista, go to the Start Menu > Control Panel > in the top right-hand corner of the Control Panel, open the ‘View’ dropdown menu > select ‘Category’ > ‘Network and Internet’ > ‘Network and Sharing Center’ > select ‘Change Adapter Settings’ from the left column > right click on your WiFi adapter (WiFi or Wireless Network Connection) and select ‘Enable’. For Windows 8, from the Apps screen, swipe/scroll to the right and find the ‘Windows System’ category > Control Panel > In the top right-hand corner of the Control Panel, open the ‘View’ dropdown menu > select ‘Category’ > ‘Network and Internet’ > ‘Network and Sharing Center’ > select ‘Change Adapter Settings’ from the left column > click on your WiFi adapter (WiFi or Wireless Network Connection) and select ‘Enable’. For Windows XP, go to the Start Menu > Control Panel > in the top right-hand corner of the Control Panel, open the ‘View’ dropdown menu > select ‘Category’ > ‘Network and Internet’ > ‘Network Connections’ > ‘Wireless Network Connection’ > select ‘Enable’. If no WiFi adapter/WiFi card is listed, most likely this device does not have WiFi capabilities - you could solve this issue with a USB WiFi adapter. If you have a WiFi enabled device and your WiFi is turned on, but you’re still receiving this error because we are unable to pinpoint your location. This might be due to the fact that the WiFi network is low in range, which is more common in rural areas. You may be in an area with few WiFi signals and/or have weak WiFi strength. If so, you could benefit from a WiFi extender to increase your WiFi network range. Mobile rooted / "jailbroken" devices will always be blocked as they are strictly prohibited. You will only be accepted if you use a mobile device with original, unmodified factory specifications. Please play on a different device. A cell phone that is turned off or does not have reception is unable to connect to its provider. Therefore, it will return an error message. To resolve this, please ensure that your cell phone is with you, powered on and within reception. Then, close/restart the software and login again. If this still doesn't work, reboot your phone. After connecting to the network, try logging in to the software again. Also, make sure that your WiFi and Location Services are turned on. Your cellular accuracy may also be poor. If possible, move to a different location for better cellular accuracy. Accuracy typically improves in more populated areas, with as many surrounding cell towers/WiFi hotspots as possible. Delaware Park Online support the following carriers - AT&T, T-Mobile, Sprint, Verizon and Cricket. If your mobile phone network is not listed, consider purchasing a low-cost prepaid phone to usefor DelawarePark Online instead of switching cell providers. Some players that are located in Delaware border towns may experience difficulties verifying their cell phones. Please contact us for further assistance. LTE enabled phones may not be able to complete the verification process. Please turn off LTE on your phone by following the manufacturer instructions. For Apple customers using the iPhone 5 and up , please click here. 6. After shutdown is complete, turn your iPhone on again. iPhone is now ready for iGaming! Make sure that you’ve enabled GPS tracking on your cell phone. Opening a map program (such as Google Maps) to “ping” the towers may help. Note: We’re always here to help you, so if you find that you’ve tried all our solutions and continue to experience problems, please contact us for further assistance. How will you verify that I’m in the state of Delaware? Keep in mind that accuracy typically improves in more populated areas, with as many surrounding cell towers/WiFi hotspots as possible. 2. IP Address – If WiFi tracking is unsuccessful, we will try to verify that you are in the state of Delaware by tracking your IP address. 3. Cell Phone – If both WiFi and IP address tracking are unsuccessful, we will try to verify your location by tracking your cell phone. Your cell phone must be turned on and have adequate reception. It will also need to be able to receive text messages from short codes. You will receive a text message requesting permission to locate you. Please reply “yes” in order to enable location tracking. Yes, as long as you are a US cell phone subscriber, your location can be accurately verified while roaming. We don’t support international roaming. You may be physically located in Delaware, but close to another state’s border where the closest cell tower is out of state. In this case, the location verification procedure will fail. First, upload the document images to your computer, using either a Scanner or Digital Camera, ensuring that the images are clear and legible. 3. Click 'Browse' and select the required data files. 4. Once completed, click 'Upload' to finalize the procedure. If your address is longer than the 35 characters presently permitted within our 'Address' field, please abbreviate wherever possible. Please also note that our 'Registration' fields will ONLY accept letters of the English alphabet and/or numbers. You can sign up for an account and make a deposit or a withdrawal from anywhere in the US. However, you must be in Delaware to play. Delaware Gaming Regulations requires us to collect your ID and other personal information to verify your age and identity. No credit or background check will be run nor will your information ever be shared with a third party. Protecting the security and privacy of your personal information is of utmost importance to us and we take thorough measures to ensure that this data not be compromised. No, you are only allowed one account. Additionally, you cannot close your account and open a new one. 1. 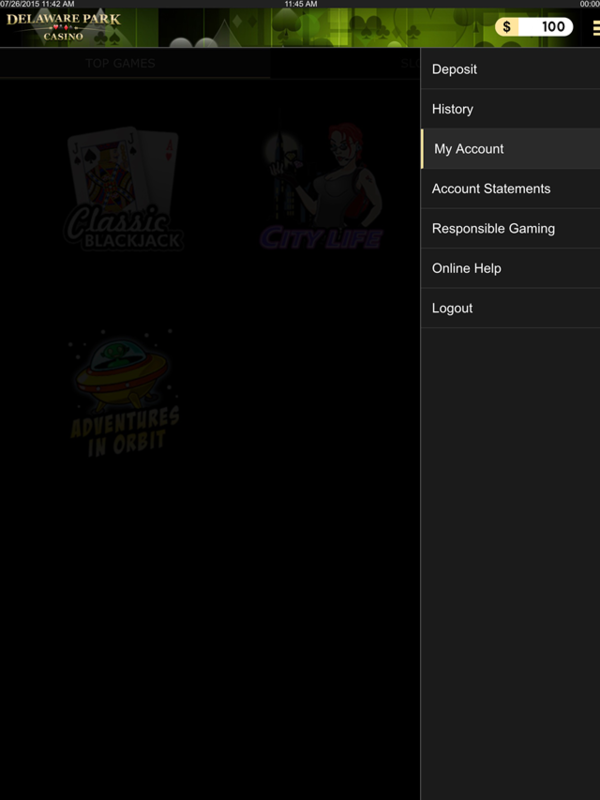 Click on ‘My Account’ in the top right-hand corner of the casino lobby. 2. Select ‘My Account’, the first option listed in the dropdown menu. 3. On your ‘My Account’ page, select ‘Self-Exclusion’, the last option listed on the left side of the screen. 4. Click on the ‘Request Self-Exclusion’ button. 5. An ‘Enable Cooling-Off / Self-Exclusion’ window will appear. Select one of the cooling-off periods. 6. Click on the ‘Submit’ button. 1. 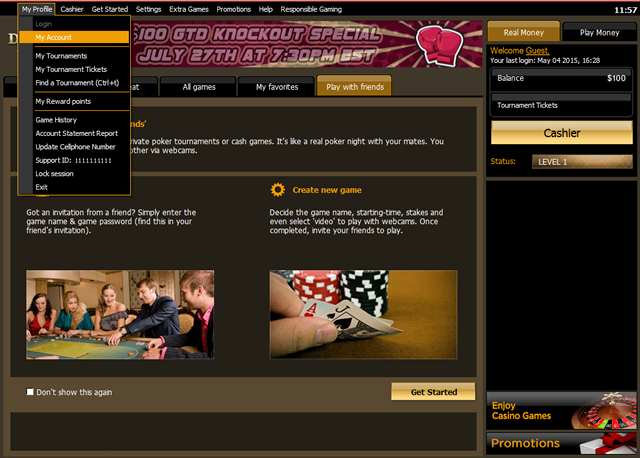 Click on ‘My Profile’, the first tab in the top left-hand corner of the poker lobby. 2. Select ‘My Account’, the second option listed in the dropdown menu. Follow steps 3 – 6 listed above in the ‘To cool off through your casino software’ section. 1. Click on ‘My Account’, the third option listed in the dropdown menu. 2. 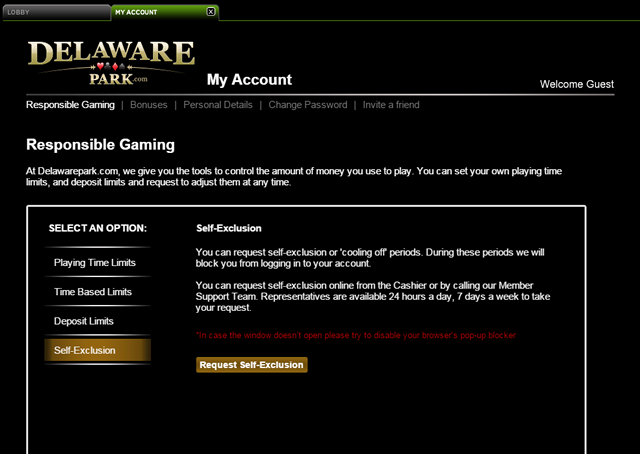 On your ‘My Account’ page, select ‘Self-Exclusion’, the last option listed on the left side of the screen. 3. Click on the ‘Request Self-Exclusion’ button. If nothing happens, go to your browser settings >Safari>General> Block Pop-ups and disable your browser pop-up blocker. 4. A pop-up window will appear. Click ‘Allow’. To close your account for 1 year, 5 years or opt for permanent self-exclusion, please contact the Delaware State Lottery directly. If your answer to one or more of these questions was yes, we recommend that you request self-exclusion and seek professional help. Resolution – recommended 1024x768 and up.